People hold a banner as they take part in a protest march in London, against U.S. President Donald Trump's ban on travelers and immigrants from seven predominantly Muslim countries entering the U.S., Feb. 4, 2017. A U.S. federal appeals court is due to hear oral arguments Tuesday in the legal battle over President Donald Trump's executive order suspending the country's refugee admissions program and banning entry to people from seven Muslim majority nations. A brief filed by the Justice Department defends the ban as a "lawful exercise of the president's authority over the entry of aliens into the United States and the admission of refugees." It calls a federal judge's order suspending the ban an error and "vastly overbroad." The states of Washington and Minnesota are the plaintiffs in the case. Court filings supporting them have come from attorneys general from 15 other states, the American Civil Liberties Union and a group of nearly 100 companies, while a number of companies have submitted briefs in support of the ban. 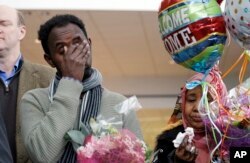 Isahaq Ahmed Rabi, left, wipes his face as he stands with his wife during a news conference shortly after Rabi's arrival at Seattle Tacoma International Airport, in SeaTac, Washington, Feb. 6, 2017. Rabi was blocked from entry to the U.S. last week due to President Donald Trump's immigration order. Rabi is a citizen of Somalia. His wife is a U.S. citizen. Two former secretaries of state, John Kerry and Madeleine Albright, say the executive order was "ill-conceived, poorly implemented and ill-explained." "We view the order as one that ultimately undermines the national security of the United States rather than making us safer," they wrote, in contrast to Trump's arguments that the ban would enhance national security. The case is likely to end up before the U.S. Supreme Court. One analyst, New York-based attorney Dan McLaughlin, told VOA Persian's New Horizon show that the top U.S. court has a history of rulings that could be favorable to Trump's case, if it gets that far. 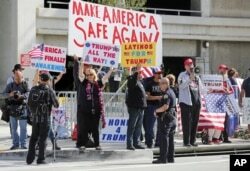 Police stand by as demonstrators who support President Donald Trump's executive order barring entry to the U.S. by travelers from seven Muslim-majority countries demonstrate across the street from the Tom Bradley International Terminal at Los Angeles International Airport, Feb. 4, 2017. "The Supreme Court has held for a long time that Congress has nearly unlimited authority in deciding who can enter the country — an authority that includes excluding people from particular countries, as it did with Chinese immigrations in the 1880s," said McLaughlin, also a columnist for the conservative news site National Review. "Because the president is relying on an authority delegated to him by Congress, he has a broad authority to act on immigration within the law, whether you think his policy is wise or not." But McLaughlin also said Trump's past advocacy of a U.S. ban on Muslim immigration when he was running for the presidency could come back to hurt him with the Supreme Court. "There's no question that the president has a legacy of comments that are going to make it more difficult for him to defend [his executive order on immigration] in court and the public," he said. Last Friday, U.S. District Court Judge James Robart of Washington state temporarily blocked Trump's executive order, putting a hold on travel to the U.S. by refugees and others from the seven Muslim majority countries: Iran, Iraq, Libya, Somalia, Sudan, Syria and Yemen. One such visa holder from Iran, Behrouz Naderlouei, told VOA Persian's NewsHour program that he arrived at Los Angeles airport in California on Sunday after having been unable to make the trip from Abu Dhabi last week when the travel ban was in force. Speaking via Skype from California, he said the L.A. airport immigration officers were "very respectful," as they asked him and other Iranians who were on his flight to provide fingerprints and travel documents. "After receiving my passport, an officer smiled at me, and said ‘Welcome to America'," Naderlouei told NewsHour. Behrouz Naderlouei, an Iranian who gained entry to Los Angeles on Sunday after having been initially barred from traveling to the U.S. when the Trump travel ban was in force, speaks to VOA Persian’s NewsHour show from California, Feb. 6, 2017. "The judge opens our country to potential terrorists and others that do not have our best interests at heart," Trump tweeted Sunday. "Bad people are very happy!" The president said he has ordered the Department of Homeland Security to check people entering the United States "very carefully," adding that the courts have made the job "very difficult." Vice President Mike Pence defended Trump's criticism of Robart, saying the president expresses himself in a "unique" way and the American people find it refreshing. But Senate Republican Majority Leader Mitch McConnell said on CNN he thought it was "best not to single out judges for criticism." New Horizon host Mohammad Manzarpour and NewsHour host Parisa Farhadi of VOA's Persian service contributed to this report.